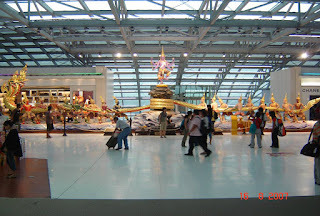 In Bangkok, Thailand, there is new international airport called Suvarn-bhoomi. Very interesting to know that country surrounded by other major religion has such a huge display from the scripture of Devi Bhagavat and Vishnu Puran. 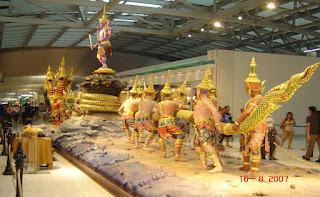 As is well known - majority of the population in Malaysia , Indonesia, Thailand, Cambodia etc., etc., are not Hindus - but they have the culture of respecting their forefathers who were Hindus - and also the Hindu Sanatan Dharma which is unique and has no comparison. 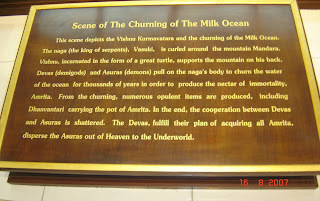 Please see this beautiful exhibit - which is very meaningful and has a message to the Society. 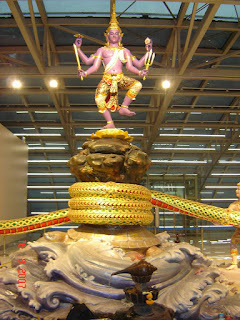 When asked: Can we imagine putting up this kind of things in our Air Ports in India? Someone answered: There will be protests from so called secularists, pseudo secularists etc. etc.